Trust: Are we building trust with people... trust in our service, in our company, and in our team...? Are we choosing to do the right thing for the client in every decision? Relationships: Are we doing everything we can to build a long-term relationship with this client on this project? Excellence: Is this the BEST work we can do? How can we make it better? Enjoyment: Are we enjoying my work, keeping a positive attitude that keeps me at my creative and quality best? Creativity: Are we thinking outside the box? Are we creating new ideas? Charity: Are we focused on helping others or on helping ourselves? Are we working toward our client's goals or our own? At XI Interactiv, our QA is vital to our mission, but the real drivers in our business are our Core Values. We measure our incremental and ultimate success by the journey toward and application of these values to everything we do. 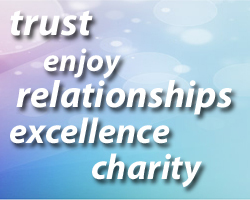 It is our Core Values that really matter. These are things we personally believe. These are values we live our life by, so this is how we conduct business too. These are not just good policy ideas, they are the right of every human being simply by virtue of his or her humanity.